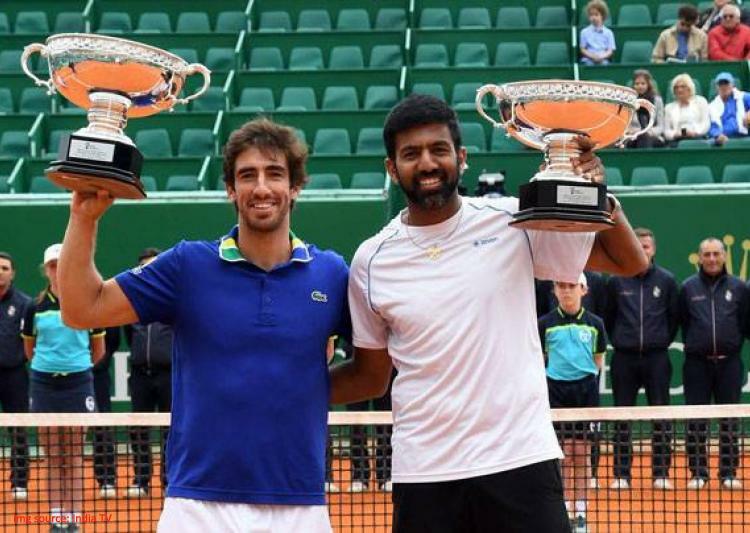 India's Rohan Bopanna and his Uruguayan partner Pablo Cuevas lifted their first ATP World Tour title together when they downed seventh-seeds Feliciano Lopez and Marc Lopez in a three-set battle in the final of the Monte-Carlo Rolex Masters in Monaco on Sunday. The unseeded Indo-Uruguayan pair outwitted the Spanish team in the Match tie breaker for a 6-3 3-6 10-4 win in 74 minutes. It was the second title of the season for Bopanna having won the the season-opening Chennai Open crown with compatriot Jeevan Nedunchezhiyan. "I'm really happy to win our first title together. I have come to Monte-Carlo so many years, it's such a historic tournament. We had a tough start to the season, but it’s great to have won. We came through some close Match tie-breaks this week and it’s a good start to the clay season. I’m looking forward to the rest of the tournaments," said Bopanna. Cuevas said, "I am really happy, as I didn’t started the season well. I'm happy to win with my partner in the first tournament on European clay and I hope for a good run through to Paris." Bopanna is now 16-24 in doubles finals and 4-4 in Masters' summit clashes. It was Cuves' second Masters trophy, adding to the 2015 Rome Masters triumph with David Marrero. Marc Lopez, one-half of the Rio Olympic champion team, came under pressure in his first service game at 1-2, 30-40, when Bopanna feinted a switch at the net off a long rally to strike a forehand volley winner into space. Bopanna and Cuevas held onto the break and wrapped up a 28-minute set when Feliciano Lopez mistimed a forehand wide on Bopanna's serve at 40-15. In the first game of the second set, Feliciano did well to hold as he recovered from 30-40, including two break points. At 1-2, 30-40, Cuevas over-hit a lob long to gift the Spaniards their first service break and it proved to be enough for Feliciano, serving at 5-3, to strike two straight aces for a hold to 30. The greater weight of groundstroke by Bopanna and Cuevas was felt in the Match tie-break as the pair took a 6-0 lead, largely targeting the volleys of Marc. Although Team Lopez recovered to 4-8, Cuevas sealed the first match point opportunity with a forehand down the line that Feliciano could not return cleanly. They were trying to become the third Spanish team to win the Monte-Carlo title in the Open Era (since April 1968), joining Sergio Casal and Emilio Sanchez in 1988 and Rafael Nadal and Tommy Robredo in 2008.